Lt. 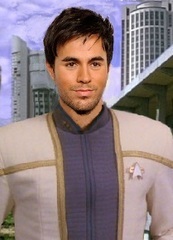 Commander Valentín Gutierrez is the Temporal Investigations Liaision to Forever World, Gateway Sector. Physical Description: Slim, svelte and handsome, with warm brown eyes. Moves with grace. Dignified, yet youthful. A snappy dresser when out of uniform. Val was practically a romantic at birth and always dreamed of seeing the stars. His eagerness and adventurous spirit led him to Starfleet, where he impressed his superiors with his willingness to serve. During his time on the edges of explored space, he met Dr. Petra Shannon and pursued her with wine, roses and candlelight. When Petra took an assignment in the Gateway Sector, Val was surprised, but pulled a few strings and got himself assigned there as well. Val is diligent about his duty. He seems to have something of a split personality. He is serious as death when he's on the job, but happy-go-lucky and charming when off-duty. Personal Traits: While his name is pronounced "bahl-in-TEEN" in his home country, most of his friends call him Val, pronouncing the V the English way. There is a story behind this, but he is bashful about it. Val is a cheerful, friendly fellow who can seem shallow and vain at first, but is in truth intelligent and perceptive. He feels things deeply, but hides this behind a facade of charm and nonchalance. He is a true romantic and enjoys lavishing those he loves with praise and gifts. Has been called sweet. Is something of a flirt. While on duty, Val is serious and dedicated, a hard worker. Val is in pursuit of Doctor Petra Shannon and considers himself her boyfriend. He is currently attempting to woo her to the next level in their relationship. Hobbies: Val enjoys music of all kinds and can play a variety of instruments from many different planets and cultures. He has an impressive singing voice. While fit, Val doesn't see the need to participate directly in sports, although he does enjoy being a spectator and has been known to place bets during sporting events.